Needless to say, the province of Fars is one of the oldest areas in Iran that houses the old and ancient monuments and buildings, which show the magnificence and history of the country. The Palace of Ardeshir Babakan, one of that ancient monuments of the Sassanid era, is located in the north of the small town of Firoozabad, considered to be one of the most significant palaces of ancient Iran, in terms of its architecture and structure. 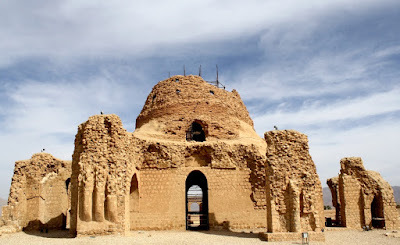 It is the palace of the founder of the Sassanid dynasty and the regional has connections to Alexander the Great and the Achaemenian. Some archeologists believe that the building was not a palace but a fire temple. The reason for their belief is that every important building built along the water in that era, was a place to worship the goddess Anahita. Absolutely impressive are the vaulted domes and the arches in the courtyard as they illustrate how advanced was Persian architecture two thousand years ago. If you would like to know more about ancient Iranian history, Uppersia also suggests you to explore some historical sites near this place like ancient city of Gour (built by Ardeshir, first king of the Sasanid Empire).